Fish Creek Pond is considered by many the finest and most attractive of all Adirondack campsites. Certainly it has few equals and no superiors. It embraces more than two miles of the shore line of the pond, providing campsites directly on the water for everyone. The sandy, well drained soil and the moderate shade of white birches and red pines makes this site an ideal one during wet weather. A fine beach runs almost the entire length of the campsite and bathhouses have been provided for transients. The location of this campsite in one of the best watered regions of the Adirondacks makes boating very popular. Boats may be hired nearby and one may embark at the campsite and explore more than a dozen bodies of water and return without once touching land. State Highway Route 10 passes the campsite. In the wake of the State highway came the demand for camping sites. Some of them, like the site on Fish Creek Pond, have fine water frontage, with scores of open fireplaces made as foolproof as possible. They tempt thousands of campers, many of whom spend their entire vacations there at a nominal expense. Those who care to get away from the crowds can always load their boats or canoes with duffle and find a camp site of their own, fare from the highway. Fish Creek was originally opened in 1920 by the Conservation Commission with an open camp lean-to and fire rings. The original open camp had a half dozen fireplaces covering approximately 1/4 of an acre (NYT). In 1926 campsites were established at designated areas with 20 tent sites in total along with sanitary facilities and a well. 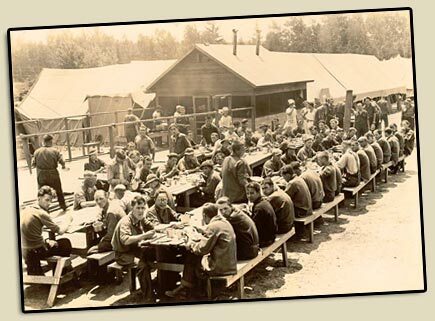 In 1927 the campground was doubled in size to approximately 40 sites with 1,888 campers registered. In 1928 the campground was again doubled in size to approximately 80 sites. A 1928 Conservation Department report crowed, "Many people consider Fish Creek Pond the ideal camping spot in the Adirondacks and there is much to justify their opinion. The fact that it has grown from one open camp and a few fireplaces covering an area of perhaps a quarter of an acre early in the present decade to a city of tents having a shore frontage of one and a half miles during the past summer is sufficient evidence of its attractions and popularity." In 1931 the campground was expanded to 264 sites and was visited by 45,750 campers. In 1935 the park was enlarged again by the Conservation Commission. In 1936 Mr. Marvin Wilson was the camp naturalist at Fish Creek Pond. In 1936 a total of 61,525 man day visits were registered at Fish Creek (source Tupper Lake Free Press Aug 20, 1936). Fish Creek has a population of about 2,500 during July and August and represents a good cross section of the US and Canada. Evening entertainment arranged by the campers themselves and held in a large outdoor amphitheatre is a popular feature of the campsite. (source Tupper Lake Fee Press May 28, 1936). In the 1940's, sites 250 and 251 had wooden platforms erect on them complete with tents. These were reserved for forest rangers or camp employees on vcation. Later in the 1950's the platforms were removed and the sites became available to the general public. (source Glen Peters). In the late 1950's the only potable water was obtained from a hand pump located near site C8. Campers would go there every morning for water (source Kevin Kirsch). During the 1950's there used to be platform camps in the area from site 200 to 230. These could be rented for the entire season. There were also platform camps on Follensby Clear Pond and up in Floodwood and Little Square Pond (source Kevin Kirsch). In 1951 a total of 121,000 campers registered at Fish Creek. In 1951 Rollins Pond was opened to keep up with the ever increasing demand for campsites, with the original plans being completed in 1955. In 1952 fees to camp at Fish Creek are implemented for the first time, a mere $.50 per night! In 1952 they expected camper total for the season to hit the 150,000 mark before the campsite closed on September 15th. Peak demand for campsites was reached in late July and early August, when no vacancy signs were out daily and hundreds of visitors had to be sent elsewhere. Up to Labor Day, 175 campsites were still occupied. (source Tupper Lake Free Press Sep 4, 1952). In 1955 the "No Vacancy" sign was out much of the summer at Fish Creek (source Tupper Lake Free Press July 28, 1955). In 1956 the Tupper Lake town Democratic chairman petitioned the Conservation Department to restore the Cross Clearing campsite to relieve pressure on Fish Creek where campers frequently had to wait in line for hours for a vacancy. (source Tupper Lake Free Press Mar 4, 1981 - flashback). In 1956 the proposal to re-open the Cross Clearing Campsite to relieve pressure on Fish Creek was struck down as the Rollins Pond expansion in 1956 was expected to be completed mid-summer providing a total of 200 campsites at Rollins. (source Adirondack Daily Express May 23, 1956). In 1958 Rollins Pond was expanded to keep up with demand. In 1960 Rollins Pond was expanded to keep up with demand (65 new sites). In 1973 both Fish Creek and Rollins Pond remained open with caretakers on duty until December 4th. (source Tupper Lake Free Press & Herald Sep 5, 1973). In 1975 Fish Creek is offered as 100% advanced reservations, Rollins 20%. While state wide, public campsite usage averages 68%, Fish Creek operates at 95% capacity. Fish Creek has a capacity of 1,483 individuals on its 353 sites. In 1974 it registered 33,236 campers and had to turn away 2,566 people. The major explanation for the unparalleled popularity of this one campground is that it has access to Upper Saranac Lake and has a good view out over the water. Fish Creek is one of only 6 other state parks that has showers. In 1987 Fish Creek closes on December 4th (source NYT Sep 4, 1987). In 1988 (and possibly 1987) the DEC offered reduced rates of $6 per night in the fall. In 1995 the nightly cost for a campsite was $15. In 1997 Fish creek was visited by 99,333 campers. In 1998 Fish creek was visited by 102,651 campers. In 1999 Fish creek was visited by 97,527 campers. In 2000 Fish creek was visited by 112,989 campers. In 2001 Fish creek was visited by 119,691 campers. In 2002 Fish creek was visited by 116,352 campers. In 2002 Fish Creek received a $275,000 grant under the 1996 Clean Water.Clean Air Bond Act. In 2003 Fish creek was visited by 104,611 campers. Today the park is now 121 acres in size with 355 campsites. The original natural beach was located at approximately where sites 67-77 are today. It was later relocated to its currently location around 1969-1971. During the years of the old beach, Hickock's Boat Livery would be granted a permit each season to run their boat livery services on the site of the current beach. Once the beach was moved, Hickock's was revoked further permits at which time they aquired the property they currently own on the other side of the bridge on Route 30. Carolyn Hickock can still be found working over at the Livery with her son Robert. Carolyn grew up spending her summers living on one of the old tent platforms back in the 1930's. NOTE! If you or someone you know has any additional information on the history of Fish Creek and 'The Birches', please email me at dave@campadk.com. Any info would be greatly appreciated! You may also want to watch the Fish Creek Historic Postcard Show and the NY State Photo Archive of Fish Creek from 1916 to 1934. A work in progress.... Certainly much more coming! Special thanks goes out to Steve Collins for providing various postcards from his extensive collection, for use on the site.